As a lover of the iPad, it is very difficult for me to admit that purchasing the iPad mini has made me think it’s the size the iPad should have been in the first place. I’ve now been using my iPad mini for a week and it simply makes so much more sense as a proper mobile device. The apps are the same and the feel is the same, it’s just half the weight and much more portable in your handbag, not that I have one! In landscape view, the iPad’s keyboard feels pretty much the same size and with a condensed screen of the same resolution the pictures and various things are much crisper. 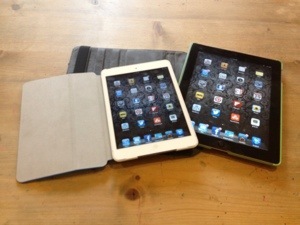 The original full-sized iPads with a case around them were virtually the same weight as a small coffee table book. The new iPad mini really feels like a normal book in your hand and you look a lot more normal in public when reading. As an upgrade from my iPad 2, the extra features in these new devices have been very useful already. For example, this entire blog post has been dictated to the new microphone dictation feature on the keyboard. This new feature makes very few mistakes and has been very useful in churning out large pieces of writing. It has also been very nice finally having a proper camera, with all 5 megapixels. I would say that not having the Retina screen is actually a benefit as it increases the relative power of the iPad with its new A5 processor not having to process all those extra pixels. To be honest, looking at photos and films seems the same to me. I find that with creative apps the workspace or paper can be zoomed in on and so haven’t really noticed any difference having a smaller screen. You do have to be slightly more careful when making clicks on webpages but again you can zoom to solve this problem. Everybody I have handed it to to have a play with has immediately said they want one and would swap it their full-sized iPad. I also feel that students, particularly at primary school, will prefer the size. I have always felt that primary school children would struggle long term, working continuously with a full sized iPad, due to its weight. A smaller size means a slightly weaker wireless pickup and your school will need a good wireless coverage for it to receive full signal. Saying that, I’ve not had any problem in my school or in cafes. I’ve just noticed that I generally have two bars on my wireless icon rather than my usual three. The iPad mini is still an iPad, just more portable, flexible and less intrusive in the classroom. I thought the iPad was the perfect student accessory but the iPad mini has proved me wrong. One extra great experience was the complete iCloud backup transfer from one iPad to the other – Amazing! All apps, files, data and settings – all over wireless at school. I love Apple! Next How to organise an iPadded Department.